The Champions League quarter-final first legs took place this week, with more low-scoring games than we saw in the last 16. There were 52 goals in eight last-16 ties, but only six goals in this week's four ties. 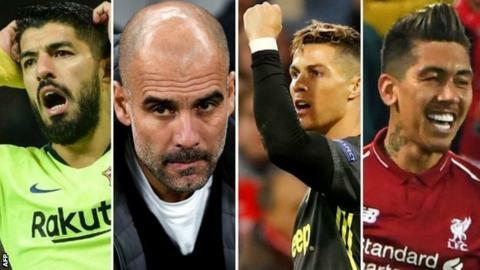 That does not mean the matches were short on talking points, with the BBC Radio 5 Live Football Daily team discussing Liverpool's 2-0 win over Porto, Tottenham's 1-0 victory against Manchester City, Barcelona's 1-0 win at Manchester United and Ajax's 1-1 draw with Juventus. Tottenham pulled off an impressive 1-0 win in their first European game at the new Tottenham Hotspur Stadium thanks to Son Heung-min's 78th-minute strike. But a lot of the talk after the game was about City boss Pep Guardiola, who has won only three away games in the Champions League knockout stages since leaving Barcelona in 2012. But why has Guardiola struggled on the road in Europe? He has not won the Champions League since 2011 with Barcelona. "He adjusts far too much," said Honigstein. "A Guardiola team will never sit back and play it long. But when it comes to the details and game plan, formation, it changes all the time. It's a real problem. He's often his own worst enemy in these big games." Cristiano Ronaldo gave Juventus the lead with a diving header at the Johan Cruyff Arena, but David Neres equalised to give Ajax hope going into the second leg in Turin. "They (Ajax) had 61% possession, 19 attempts and six on target," said Balague. "Juventus' goal came from their only effort on target. "You're talking about a team (Ajax) who are doing what they do wonderfully based on a way of understanding the world, not just football. It's young people just having fun on the pitch. There were points when they were actually smiling. They seem to celebrate football and enjoy themselves. "Frenkie de Jong is happy to play football. Why wouldn't you be happy?" Plenty of Ajax's young stars are expected to be signed by Europe's top clubs at the end of the season, with midfielder De Jong already agreeing a £65m move to Barcelona. Honigstein said: "[Manager] Erik ten Hag said in an ideal world he'd keep this players for another three years, but it won't happen so there's no point thinking about it - just make the most of what we have. Honigstein thinks Ajax can shock Juventus in the second leg, as they did to Real Madrid in the previous round. Nobody expected you to come through against Real Madrid. Nobody expected you to get out of the group. "They keep getting results. If you can win 4-1 at Real Madrid, why can't you beat Juventus 1-0? The lack of experience seems to be a positive. They don't think about the pressure or fear of losing." But where will Netherlands international De Jong play for Barcelona? He is seen as a long-term successor for holding midfielder Sergio Busquets, although the Spain midfielder is only 30. Balague said: "It's not his best position. It's one he'll have to learn. He feels more comfortable in front of a holding midfielder. I've got the impression he can be used there for a while until Busquets gives way. "They told him while negotiating, 'don't worry, you'll start most of the time' - because he was worried about that - 'and we'll get rid of one of the midfielders anyway so you can fill that gap'. Nobody knows [who the midfielder is]. They have tried to push Ivan Rakitic out. But boss Ernesto Valverde doesn't want him to go. "De Jong has been bought to be the new Busquets and he has the intelligence. He's a very complete midfielder." Laurens said: "It would be a shame to turn him into the new Busquets. He has so much more energy everywhere on the pitch. I know Barcelona play a different style of football to Ajax. Busquets is not as good as he used to be and he's getting older." Liverpool have one step in the last four - are they now favourites to win? The most comfortable team from the quarter-final first legs appear to be Liverpool after they beat Porto 2-0 at Anfield. If they progress, they will meet Barcelona or United in the semi-finals. Liverpool reached last year's final, where they were beaten by Real Madrid. But this season they have looked more solid and are battling for a Premier League-Champions League double. Honigstein said: "This is a Liverpool who have learned their lesson. You see it in the league where they are much more controlled and not playing with chaos and anarchy. "While they had these poor performances in the group stages, that feels like a long time ago. This Liverpool team don't strike you as one who could concede three or four goals like last season. "They were always going to dangerous in Europe because they're good on the counter-attack. Now they can do that and keep it solid at the back. "I'm beginning to change my view. I thought this could be Barcelona's year but after the first legs you'd make Liverpool favourites if they meet in the semi." Balague said: "Barcelona, while they're not as brilliant as they used to be, compete very well. They can close the shop and defend well. "It would be so tight and only by one goal. Barcelona to the final." Barcelona win at Old Trafford... but is Suarez fat? Barcelona were far from at their best against United, but managed to win 1-0 thanks to Luke Shaw's own goal from Luis Suarez's header. But was the 32-year-old Uruguayan carrying a little extra weight? French football writer Julien Laurens said: "How much weight has he put on? It's unbelievable. "I hadn't realised from watching his games on TV - it was the first time I've seen him live this season. I can't believe how fat he is. I don't know how at a club like that you allow a player to let himself go so much." Spanish journalist Guillem Balague countered: "It's strong muscle. I was with him a month and a half ago at an interview. Close up, he doesn't look that big. He just looks like he's put muscle on. "He's carrying a knee injury so has to develop muscles around his leg. He looked like a strong man, not a fat man. But he struggles with weight every season."